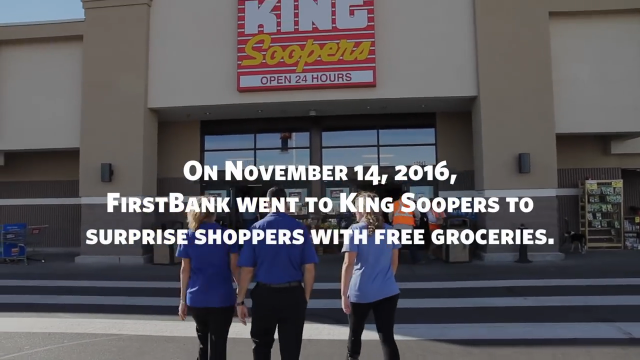 A few weeks ago, our management team (VP of Marketing Joe Amato-Baril, Banking Officer Cassie Sosa and Regional President Emily Robinson) went undercover as King Soopers employees and surprised more than 100 unsuspecting shoppers by paying for their groceries. In return, we asked them to consider paying it forward to their favorite charity on Colorado Gives Day, December 6th – even if it’s just $10. Throughout the day, we helped all walks of life: mothers and families who hit hard times, senior citizens who lived on restricted budgets and folks who just appreciated the gesture. Why doesn’t FirstBank just give money to folks who really need it? WE DO! We do a lot every year to help the homeless, those with disabilities, struggling families and children and many more. This weekend we’re hosting a Gingerbread House Decorating party benefiting Habitat For Humanity, which builds safe homes for low-income families. We also donate several million annually and our employees volunteer countless hours, helping hundreds of nonprofits from the Autism Society to YMCA. But we can’t make a big impact by ourselves. We need more people to help give back to causes they care about, too. This is where “Pay It Forward” comes into play. Does a “Pay It Forward” campaign really work? Yes, it does. We track the results and it helps us drum up additional donors for Colorado Gives Day. More importantly, it shows someone the power of kindness, generosity and how you can positively impact a person’s life even with a small gesture. Will you do it next year? We hope so. If you have any ideas for next year’s “Pay It Forward” promotion, tell us about it by commenting below. We hope you create your own heartwarming reactions by donating to a charity of your choice tomorrow. From tips to increasing your home’s value to costly wedding traditions to scrap, we’ll help you save smarter and spend wisely.